The Hollow Earth Theory has been around for a long time. While the first concepts were crude, this ‘crazy’ idea has slowly developed into a viable alternative to the solid Earth model. In light from today’s technology, many of our findings point towards a hollow structure as the only method to explain many of today’s scientific findings. There are four main hollow Earth models. Lets briefly discuss each one. Perhaps the earliest hollow Earth concept was proposed by Edmund Halley in 1692. His ideas were developed while trying to understand the Earth’s magnetic field. In order to explain the complex movements of the field, Halley concluded that there must be at least 4 concentric shells each with their own magnetic properties. The movement of each shell relative to the others allowed distinctive areas of the field to wander around the globe. 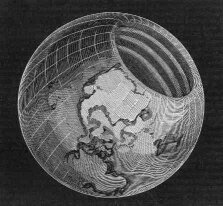 The most famous hollow Earth model includes huge polar holes between 2000 and 4000 kilometres across that open to the interior of the planet. Many hollow Earth investigators have gone looking for these holes but nothing has ever been found. Today’s satellite technology has proven that such holes are a total myth. In this theory the centre of the planet harbours a central sun that provides light and heat to the world within. This little known concept is the most bizarre of hollow Earth ideas. It works on the principle that we are actually living inside a hollow planet right now and the centre of the planet is a point infinitely far away. All the other planets, the moon, satellites and the sun revolve around this central point. Developed by us, this is the most advanced hollow Earth model today. Based on a combination of the hollow Earth and expanding Earth theories, it provides an alternate explanation for the drifting continents phenomenon thus making the tired Plate Tectonics theory obsolete. Based on our current understanding of gravity The Land of No Horizon shows how the accumulation of matter during the planet forming process naturally produces a planet structured differently to what is currently theorised. It is also shown how a planet hollows out and expands under its own gravitational power. The hollow planet structure can explain many mysteries that have plagued us for centuries such as unusual Impact crater characteristics on terrestrial planets, the mysterious Red Spot on Jupiter and seismic wave data from earthquakes here on Earth. Understanding outgassing and atmosphere formation on a hollow planet model helps us explain past mysteries such as the great flood on Earth and the Floods on Mars. An expanding Earth provides the driving force behind the drifting continents, mountain building and earthquakes and is also accountable for changing the value of gravity over time. In the past when the Earth was smaller centrifugal force from a much faster speed of rotation reduced the affects of gravity in equatorial regions. This reduction of gravity is what allowed the great dinosaurs and all past life to grow to much larger sizes. The land of No Horizon Book investigates all these areas in great detail explaining at length how all these processes work together. You will be suprised just how viable the Hollow Earth theory has become. Earths inside the Earth–a Short Note on Inner Civilizations. And a Map.